The moon Iapetus is the second of Saturn's two large outer moons (Titan being the other). With a diameter of 912.5 miles, it is the third largest of Saturn's moons and the eleventh largest in the solar system. Although being paired with Titan, it lies considerably further out from Saturn, at 2,213,834 miles. One orbit of its host planet takes around 80 days. This moon is one of the oddest objects in the solar system. 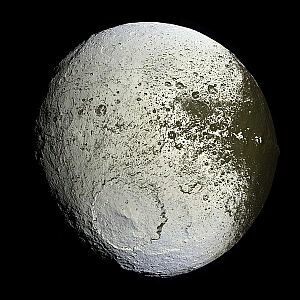 This site has a page dedicated to the weirdness of the moon Iapetus here. This page, therefore, will consider these weird features in more detail. The most striking feature of Iapetus's surface is that it's two-tone! Yes, something like three-fifths of the surface consists of a very bright, light coloured material, while the rest is very dark. The bright area consists of the usual water ice found on Saturn's other large moons and is almost as super-reflective as Jupiter's moon Europa. It is divided into two areas - Roncevaux Terra, north of the equator and Sarragossa Terra to the south. 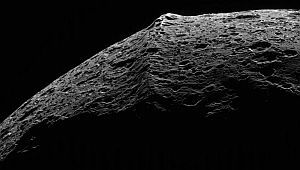 The huge crater that can be seen at the bottom of the moon in the above image is Engelier, the second largest crater on Iapetus, with a diameter of 313 miles. 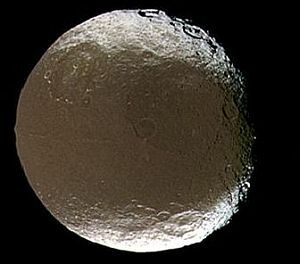 It is not known conclusively why Iapetus has this contrasting dark region. Designated Cassini Regio, its formation is considered to be as a result of some form of dark, reddish dust from somewhere in space (probably the Phoebe Ring) being deposited on the surface. This has the effect of evaporating the water ice on one side of the moon completely, while leaving its other half unaffected. Other factors crucial to this mechanism occurring successfully are the moon's slow rotation speed, its small size and low gravity, plus its distance from Saturn. The Cassini Regio is home to Iapetus's largest impact basin. Turgis has a diameter of 360 miles. Another unusual feature of the moon Iapetus is the huge range of mountains running along the equator within the Cassini Regio. Also, within the light area, there are isolated peaks. Why these mountains should hug the equator with such accuracy is not known, although there have been several theories put forward to explain it. This range is about 808 miles long, 12.5 miles wide and can contain mountains up to 13 miles high, making them some of the tallest mountains in the whole solar system. The isolated peaks within the light area can reach heights of over six miles. 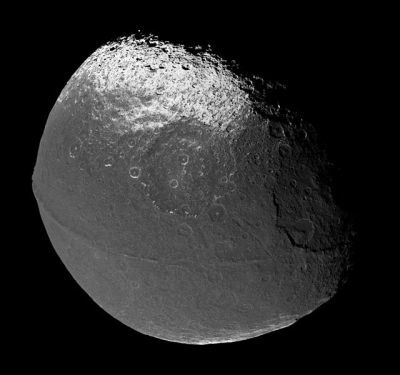 This is yet another unusual feature of Iapetus. As was mentioned at the top of the page, this moon orbits much further out than all the other large moons of Saturn. But, that's not all. In contrast to all these other large moons, its orbit is inclined away from the equatorial plane. The reason for this is not known. This graphic demonstrates this very clearly. It means that Iapetus is the only large moon from which Saturn's ring system can be viewed in its full glory. As the other large moons orbit along the equatorial plane, the rings as viewed from them would be edge-on.